Ron Wrobelewski, president of Vietnam Veterans of America’s Tri-State Chapter 949, spoke at a National POW and MIA Recognition Day ceremony in Gallipolis, Ohio, today. POW and MIA Recognition Day is observed annually on the third Friday of September to honor POW/MIA service members. Wrobelewski is a Vietnam combat veteran who served as a field radio operator with the Marine Corps from 1963–1966. Among his significant accomplishments on behalf of veterans is having a U.S. Navy ship named for WWII veteran Hershel “Woody” Williams, West Virginia’s only living Medal of Honor recipient. 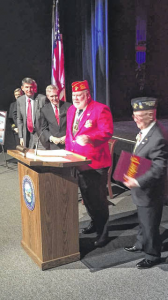 Wrobelewski has also served as commander of VFW Post 1064; general chairman of the Huntingon, W.Va., Veterans Committee for Civic Improvement, and commandant of the Marine Corps League’s Huntington Detachment 340. In addition to his chapter presidency, he also the president of the West Virginia Marine Corps Coordinating Council.